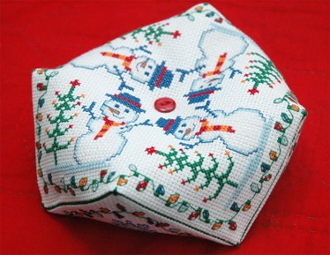 A lovely Christmas design with adorable snowmen to cross stitch. Complete instructions to finish into a Biscornu. Design size: Aida 11 count 7.1" x 7.1", Aida 14 count 5.6" x 5.6", Aida 16 count 4.9" x 4.9". Stitch count: 78 x 78 each piece. Instructions given for DMC threads with conversions for Anchor embroidery threads (not included).